In a news release today, NASA reports that its Spitzer Space Telescope has revealed the first known system of seven Earth-size planets around a single star. “This is the most exciting result I have seen in the 14 years of Spitzer operations”, said RPI graduate Sean Carey ’88, Ph.D.’95, manager of NASA’s Spitzer Science Center at Caltech/IPAC in Pasadena, California. 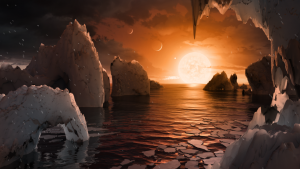 “More observations of the system are sure to reveal more secrets.” Three of these planets are firmly located in the habitable zone, the area around the parent star where a rocky planet is most likely to have liquid water.